Gold Greenies are a gold variation of Greenies in Luigi's Mansion: Dark Moon. They have 20 HP and can be found usually in all missions in each mansion. They are hidden in several places of furniture or objects and spring at Luigi when he shakes the furniture or object. They do not attempt to hurt Luigi (except for the Hockey Gold Greenies at the Ice Lake), instead they try to escape upon being sighted. Capturing one yields a large amount of treasure, a large amount of coins, Bills and usually one Gold Bar, unless caught with another ghost or with a full bar. 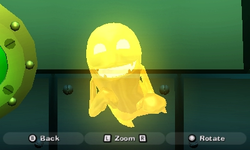 Their concept is based upon the Speedy Spirit from its predecessor, Luigi's Mansion. Both hide in furniture, both attempt to escape, both yield a large sum of money if they are captured, and both cannot be found again if the player fails to catch them. These greedy Greenies traded their slimy bodies for ones made of molten gold! Can't say I blame them. The maximum amount of Gold Greenies able to be found at one time is 5; all of them are found in a hidden room inside Old Clockworks. This page was last edited on August 28, 2017, at 02:09.